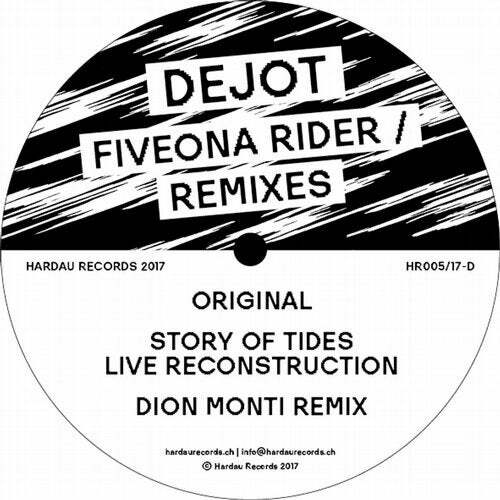 'Fiveona Rider'' by Dejot is a deep dive into unknown balearic waters. There's this beautiful synth-pad flavoured with some tape-ish detuning. Accompanied by an 80s brass-sound and a triplet-driven tribal beat - enter a new breed of summer tune. Catchy and yet unique, danceable and yet experimental. A perfect track for Hardau Records and their approach for ''house music with a twist for the open minded dancefloor''. Story of Tides is a Bern based producer. He dissolves ''Fiveona Rider'' and reassembles its components to an early morning deep house anthem. An anthem with undisputable psychedelic quality. It's all done with an Octatrack and the spirit of a raw live performance. Dion Monti from Johannesburg (RSA) also follows a deconstructivist modus operandi but places the track in a different musical context. Monti keeps it fresh with a nice electro funk bassline, well sorted percussion elements, arpeggios and surprising breakdowns. Just choose your mix - ''Fiveona Rider'' is the perfect fit for your pool party or a blurry night at your favourite underground club.